Brian Holmes reading a testimony by Eduardo Molinari, an artist who has been chronicling the injuries done to the children, especially who are being harmed by soy monocultural practice and large agribusiness in Argentina.View more about his work here. 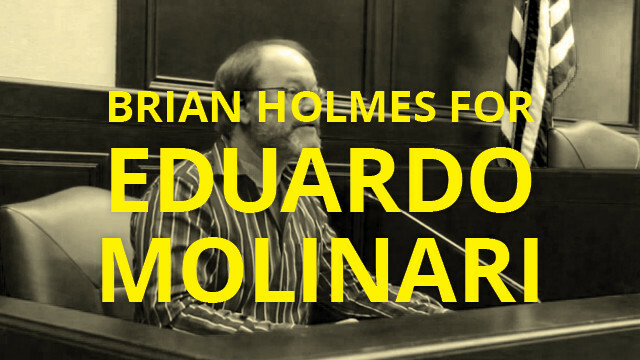 My name is Eduardo Molinari, I’m from Buenos Aires, Argentina. I´m a visual artist and a teacher in the Visual Arts Department of the National University of Art. In 2001 I founded the Archivo Caminante / Walking Archive and in 2010, together with my partner and also artist Azul Blaseotto, we founded the cultural and activist space La Dársena / The Doc, Plattform of Thought and Artistic Interaction. The Walking Archive proposes the development of critical reflections on the dominant historical narratives and actions against the mummification of social and cultural memory. Walking as an aesthetic practice, research with artistic methodologies and interdisciplinary actions are the basis of my work. Since 2008 I have been making an investigation called The soy children with which I participated in the project The Potosí Principle, a work of research in the context of the cellebrations for the bicentennials of the revolutionary movements that gave origin to the first governments independent from the Spanish Crown in the Americas. The title of the work refers to the process of agriculturization that Argentina is undergoing since the mid-90s. The most evident consequence of this process is called “soyazation” of the country. The “soyazation” process has turned the country into the world’s third producer of soya and by-products, second producer of genetically modified soya (after the USA), and first exporter of soya flour and soya oil in the world. 50% of the total cultivated lands in Argentina belongs to soya, and 90% of that surface corresponds to Monsanto’s Roundup Ready Genetically Modified soya (and Monsanto’s local representatives). This means more than 20.000.000 of hectáreas.This agrarian system and its results are only possible using Roundup herbicide, brand name of Monsanto’s glyphosate. During the 2007-2008 season, 180.000.000 litres of glyphosate were sprayed over Argentine lands, turning the country into a “massive experiment” from the eco-toxicological point of view –in the words of Andrés Carrasco, director of the Laboratory of Molecular Embryology at the <>National Scientific and Technical Research Council / CONICET. At the same time, this territory is a part of a new recognizable form in the maps of South America: the “United Republic of Soya”. Created for an advertisement by the multinational company Syngenta, this new “republic” crosses the borders of some of the national states which celebrated their bicentennials in 2010: it covers part of Argentina, Uruguay, Paraguay, Bolivia and Brazil. The rhizome of soya goes deep into the Argentine economic reality, it organizes new political alliances and, above all, it modifies the social and cultural structure of the country. In this context and during the development of my work, I started asking myself some questions that I want to share here: Are we living a transgenic culture? The hegemony of GM soya in this single-crop agriculture, is the cause of the cultural change or its best fruit? What cultural paradigms and what artistic subjectivity does the biotechnological model require? In the transgenic culture, does art become a commodity? Can semiocapitalism and its so-called cultural industries work as a huge laundry? Can its cultural institutions become huge washing machines, that through their recombining activities mean to whitewash and “purify” social conflicts, wars, genocides, inequality and poverty, economic crisis and the plundering of nature? As a human, citizen and artist I think that is it was essential to make visible the social, health and cultural consequences of Monsanto´s machinery all over the world.